There are three basic kinds of fillings used to restore teeth after decay is removed: amalgams, composites and stainless steel crowns. Most dental amalgams are silver in color and are made from a mixture of mercury and an alloy of silver, tin, and copper. Mercury makes up about 45-50 percent of the compound. Mercury is used to bind the metals together and to provide a strong, hard durable filling. Mercury has been found to be the only element that will bind these metals together in the best possible way to manipulate the material into a tooth cavity. Is mercury in dental amalgam safe? According to the American Dental Association, backed by volumes of research, mercury in dental amalgam is not poisonous. When mercury is combined with other materials in dental amalgam, its chemical nature changes, so it is essentially harmless. The amount released in the mouth under the pressure of chewing and grinding is extremely small and no cause for alarm. In fact, it is less than what patients are exposed to in food, air, and water on a daily basis. Dental amalgam has withstood the test of time, which is why it is the material of choice. It has a 150-year proven track record and is still one of the safest, most durable, and least expensive materials to a fill a cavity. More than one billion amalgam restorations are performed annually in the United States. Advances in modern dental materials and techniques increasingly offer new ways to create more pleasing, natural-looking smiles. Researchers are continuing their decades-long work developing aesthetic materials, such as ceramic and plastic compounds that mimic the appearance of natural teeth. As a result, dentists and patients today have several choices when it comes to selecting materials used to repair missing, worn, damaged or decayed teeth. Composite resins, or white fillings, are more expensive. While aesthetically appealing, they require a longer time to place and are not as durable as silver amalgam. Composite resins are tooth-colored, plastic materials (made of glass and resin) that are used both as fillings and to repair defects in the teeth. Because they are tooth-colored, it is difficult to distinguish them from natural teeth. 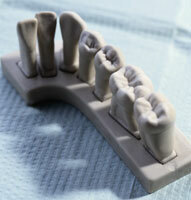 Composites are often used on the front teeth where a natural appearance is important. They can be used on the back teeth as well depending on the location and extent of the tooth decay. Composite fillings are a mixture of acrylic resin and finely ground glasslike particles that produce a tooth-colored restoration. Composite fillings provide good durability and resistance to fracture in small-to-mid-size restorations that need to withstand moderate chewing pressure. Less tooth structure is removed when the dentist prepares the tooth, and this may result in a smaller filling than that of an amalgam. Composites can also be "bonded" or adhesively held in a cavity, often allowing the dentist to make a more conservative repair to the tooth. In teeth where chewing loads are high, composite fillings are less resistant to wear than silver amalgams. Ionomers - Glass ionomers are tooth-colored materials made of a mixture of acrylic acids and fine glass powders that are used to fill cavities, particularly those on the root surfaces of teeth. Glass ionomers can release a small amount of fluoride that help patients who are at high risk for decay. Glass ionomers are primarily used as small fillings in areas that need not withstand heavy chewing pressure. Because they have a low resistance to fracture, glass ionomers are mostly used in small nonload-bearing fillings (those between the teeth) or on the roots of teeth. Resin ionomers also are made from glass filler with acrylic acids and acrylic resin. They also are used for nonload-bearing fillings (between the teeth) and they have low to moderate resistance to fracture. Ionomers experience high wear when placed on chewing surfaces. Both glass and resin ionomers mimic natural tooth color but lack the natural translucency of enamel. Both types are well tolerated by patients with only rare occurrences of allergic response. Porcelain (ceramic) dental materials - All-porcelain (ceramic) dental materials include porcelain, ceramic or glasslike fillings and crowns. They are used as inlays, onlays, crowns, and aesthetic veneers. A veneer is a very thin shell of porcelain that can replace or cover part of the enamel of the tooth. All-porcelain (ceramic) restorations are particularly desirable because their color and translucency mimic natural tooth enamel. All-porcelain restorations require a minimum of two visits and possibly more. The restorations are prone to fracture when placed under tension or on impact. Their strength depends on an adequate thickness of porcelain and the ability to be bonded to the underlying tooth. They are highly resistant to wear but the porcelain can quickly wear opposing teeth if the porcelain surface becomes rough. Stainless Steel Crowns - When there is not enough tooth structure left after decay removal of a tooth to support a typical amalgam or composite filling, or if a nerve treatment is performed on a tooth, a stainless steel crown is the restoration of choice. This is a durable, silver-colored crown that fits over the remaining decay free tooth structure and falls out with the tooth itself. Permanent teeth may also need stainless steel crowns. In this case, they are used until the occlusion stabilizes with the eruption of more permanent teeth, and may be eventually replaced by a gold or porcelain crown.